Delegating work,responsibility, and authority is difficult in a company because it means letting others make decisions which involve spending the owner-manager's money. At a minimum, you should delegate enough authority to get the work done, to allow assistants to take initiative, and to keep the operation moving in your absence. 3. To Whom Do You Delegate? Authority is the fuel that makes the machine go when you delegate work and responsibility. It poses a question: To what extent do you allow another person to make decisions which involve spending your company's money? That question is not easy to answer. Sometimes, an owner-manager has to work it out as he goes along, as did Tom Brasser. His pride in being the top man made it hard for him to share authority. He tried, but he found to his dismay that his delegating was not as good as he thought. One day when he returned from his first short business trip. Mr. Brasser stormed out of his office. He waved a sheaf of payroll sheets and shouted "Who approved all this overtime while I was away?" I did," the production chief answered. Realizing that all heads were turned to see what the shouting was about., Mr. Brasser lowered his voice. Taking the production manager with him, he stepped into his office. There he told the production man, "You've got your nerve authorizing overtime. This is still my company, and I'll decide what extra costs we'll take on. You know good and well that our prices are not based on paying overtime rates." "Right," the production man replied. "But you told me I was in full charge of production. You said I should keep pushing so I wouldn't fall behind on deliveries." "That's right," Mr. Brasser said. "In fact, I recall writing you about a couple of orders just before I went out of town." "You can say that again. And one of them - the big order - was getting behind so I approved overtime." "I would have done the same thing if I has been here," Mr. Brasser said. "But let's get things straight for the future. From now on, overtime needs my okay. We've got to keep costs in line." Mr. Brasser then followed up with his other department heads, including his office manager and purchasing agent. He called them in, told them what had happened, and made it clear that their authority did not include making decisions that would increase the company's operating costs. Such decisions had to have his approval, he pointed out, because it was his company. He was the one who would lose, if and when, increased costs ate up the profit. Yet, if an owner-manager is to run a successful company, you must delegate authority properly. How much authority is proper depends on your situation. (3) To keep things going in your absence. 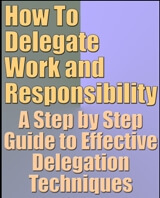 To Whom Do You Delegate? Delegation of responsibility does not mean that you say to your assistants, "Here, you run the shop." The people to whom you delegate responsibility and authority must be competent in the technical areas for which you hold them accountable. However, technical competence is not enough. In addition, the person who fills a key management spot in the organization must either be a manager or be capable of becoming one. A manager's chief job is to plan, direct, and coordinate the work of others. A manager should possess the three "I's" - initiative, interest, and imagination. The manager of a department must have enough self-drive to start and keep things moving. A manager should not have to be told, for example, to make sure that employees start work on time. Personality traits must be considered. A key manager should be strong- willed enough to overcome opposition when necessary and should also have enough ego to want to "look good" but not so much that it antagonizes other employees.